Are you kidding me with these old comic books? How many times have you opened a comic book from the 70's to maybe take a read through a classic title (like The Defenders) and suddenly realize that you bit off a little more than you could chew? Or at least, a little more than you have grown accustom to chewing. Anyone feel like getting a stick of gum? When I flipped into The Defenders #71 I was immediately bombarded with a ton of words. That's right, words! Thought bubbles, narration bubbles and bars, speaking balloons...it just didn't stop! Today's comics have panels where there are no words. These panels help pace the book or situation. In the Defenders #71 every panel had a lot to say. This could be a sign that the story is so ridiculous that unless every panel was thoroughly explained the reader would have no idea what was going on. From what I can make out just by looking at the panels of the comic of the day, the Defenders first had a trial with an un-hatted Abraham Lincoln during which Lincoln told a story about how he jumped from dimension to dimension. 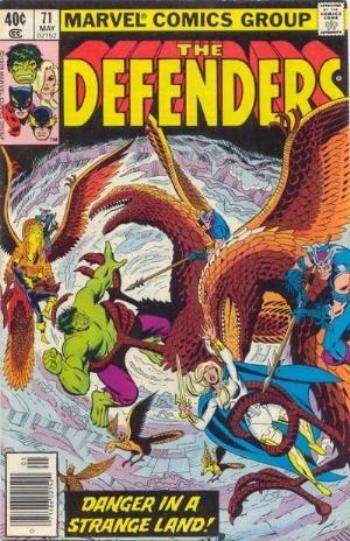 The defenders than go to another dimension to investigate his story, get attacked by giant dragon-birds, and the the Hulk comes and busts the dragon-birds up via jump attacks. In the end, Dr. Strange find his girl, hugs her with great relief to have found her, and then yells at her.